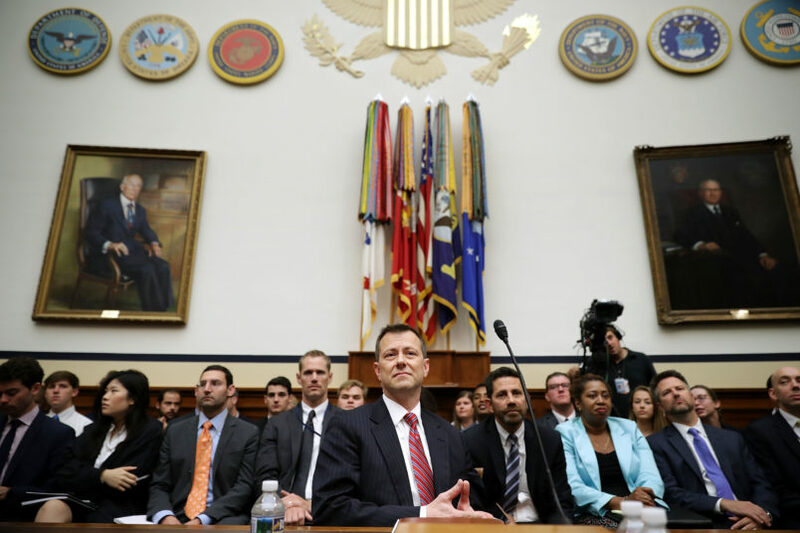 Nine hours after the start of Thursday’s extremely contentious House committee hearing, FBI official Peter Strzok was given the opportunity to explain the infamous “insurance policy” text he sent to FBI lawyer Lisa Page — a text that has become a focal point in GOP conspiracy theories of a deep state plot to undermine President Trump with the Russian investigation. According to Strzok, it was sent in the context of a debate over how aggressively the FBI needed to move on its Russia probe. He that said at the time he was arguing to aggressively investigate the Trump campaign even though doing so could put a source at risk. In the August 2016 text, which was revealed as part of a Justice Department Inspector General investigation, Strzok referenced a meeting he and Page attended with then-FBI Deputy Director Andy McCabe. “I want to believe the path you threw out for consideration in Andy’s office—that there’s no way he gets elected—but I’m afraid we can’t take that risk. It’s like an insurance policy in the unlikely event you die before you’re 40…” Strzok’s text said. In Strzok’s retelling of the discussions that he was referencing in the text, some were advocating for the FBI to move slowly — and not put the sensitive source who had provided information at risk — since Trump was not expected to win the election. “What I’m saying is look we’re the FBI. We need to do our job. We need to go investigate,” he recalled Thursday of his sentiments in that text.